“This is Ethan, my beautiful son, who sadly lost his life just over 5 years ago. This is a cherished photo of Ethan with my father, they had the most beautiful relationship. When Ethan was born at 26 weeks he was diagnosed as being profoundly deaf and having severe cerebral palsy. 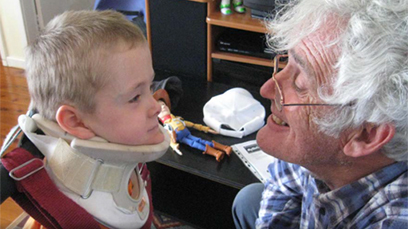 Cerebral Palsy Alliance helped us in every aspect of Ethan’s life, from eating to sleeping. We would spend at least 3-4 days a week if not more at the then, Spastic Centre. It became our second home. Losing Ethan devastated our lives and we all hope for prevention and cure–so why not aim for that? “The rugged determination of my wonderful friends who live with the effects of cerebral palsy every day inspired me to become involved in their cause. The work of Cerebral Palsy Alliance is truly magnificent – as is the dedication of every parent and carer, and the courage shown by people with cerebral palsy – and I feel that if I can put a little bit of weight behind the efforts to improve therapies and ultimately find a cure that would be a great thing. I truly believe that my generation, by remembering Cerebral Palsy Alliance in our ‘final document’, can help liberate future generations from the limitations of cerebral palsy. Thanks to you, one day no baby could be born with cerebral palsy. If you’re already thinking about your personal legacy, and the possibility of including Cerebral Palsy Alliance in your Will, we can’t thank you enough for considering us. Naturally, looking after your family and friends comes first. All we ask is that after remembering them, you consider leaving a gift in your Will to Cerebral Palsy Alliance. Most gifts in Wills – or bequests – are made by ordinary, hard-working people who want to make a positive difference to their community. A gift in your Will for cerebral palsy therapy services will help us to continue to provide the many services required by people with a life-long condition. Your gift will enhance people’s lives, helping them live to their fullest potential and achieve goals they never thought possible. Or, you may prefer to leave a bequest for cerebral palsy research, which will to help ensure that groundbreaking research is translated into real and valuable treatments, and ultimately, into ways to cure and prevent this condition. A gift in your Will is the ultimate gift you can give to children, adults and families who live with cerebral palsy, and to future generations. Thank you for considering a bequest and for sharing our vision of building a better future for people living with cerebral palsy. There are a few different ways you can include a gift in your Will, but we recommend a residual bequest. This is a gift of whatever is left of your estate (or a percentage of it) after all other gifts to family and friends, taxes and debts have been paid. This ‘residual’ can then be allocated as a bequest to Cerebral Palsy Alliance. If you’d prefer to support research, simply substitute “The Research Foundation of Cerebral Palsy Alliance”. The ABN number remains the same. As a heartfelt thank you for including Cerebral Palsy Alliance in your Will, you become part of a very special group, known as the Circle of Hands. As a member, you will be invited to special events to hear interesting speakers, meet like-minded people who share your generosity of spirit, and learn about world-class therapies and research that could not happen without your support. You will also be honoured with a unique masterpiece created by one of the artists who participate in our Arts Workshop. 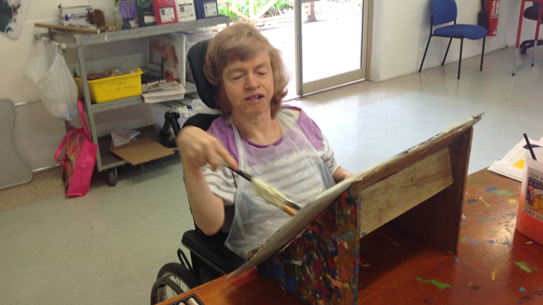 Virginia Redenbach has been painting for a number of years now and participates in our art program two days a week. She completed Certificate I in Visual Art in 2014. Cerebral Palsy Alliance is proud to be part of Include a Charity — a coalition of more than 100 Australian charities whose goal is to encourage more people to leave a gift to a charity in their Will. Include a Charity Week each September raises the profile of charitable gifts in Wills and the incredible good that happens when you make a bequest. Charity Week 2018 will take place from 10 to 16 September. If you would like to have a confidential discussion about leaving a bequest to Cerebral Palsy Alliance, our Fundraising Relationship Manager, Carol O’Carroll can help.